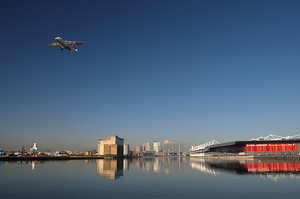 Long favoured by business travellers for its ease of access (even more so with the DLR extension) and proximity to the Square Mile and Canary Wharf, there's another reason to visit London City airport: the view. The diminutive landing strip has been chosen as one of the 'top 10' of airport approaches worldwide, landing a place amongst a litany of exotic locations: Las Vegas, Gibraltar, the Caribbean, and the Outer Hebrides. The survey organisers cited the airport's waterside location (the runway is nestled between the King George V and Royal Albert docks and is near the Thames) and remarkable views of the City. Welcome as the news will be to the airport's owners, it isn't likely to help in their current battle to increase the number of flights. The airport wants to jump from the current 73,000 annual flights to 120,000, a move backed by Newham council; however, local residents say they were not consulted, and a campaign group called Fight The Flights has taken the matter to the High Court. For those not planning to travel via London City anytime soon, but want to see the view, a cheaper option might be the cable car that TfL are in discussions to build across the Thames a little way upriver.